The Bridges To Babylon tour was announced in a press conference held underneath the Brooklyn Bridge in New York City and began on 9th September 1997 with a warm up show in Toronto, Canada, followed by another at The Double Door In Chicago. It officially began on 23rd September at Chicago’s Soldier Field followed by 55 more shows in North America, nine shows in South America, six shows in Japan and thirty-seven shows in Europe. 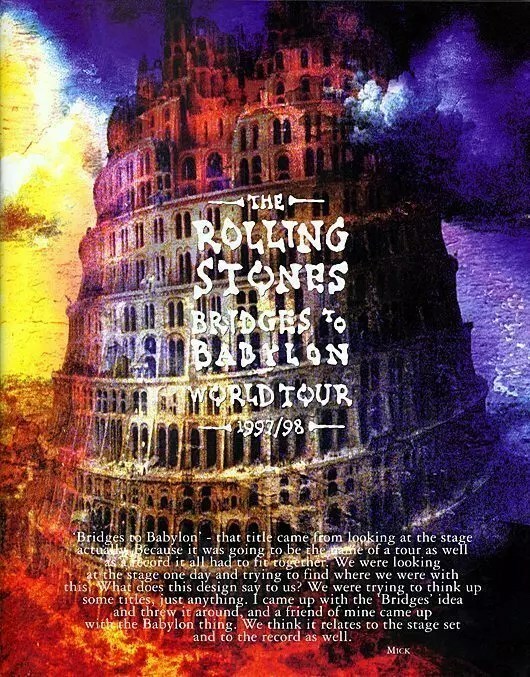 The production was designed by Mark Fisher, Charlie Watts, Mick Jagger and Patrick Woodroffe and opened with a circular central screen exploding with fireworks, from which guitarist Keith Richards emerged playing the riff to “(I Can’t Get No) Satisfaction”. This was the first tour on which the B-stage featured at almost every gig; the stage design included a 46 m (150 ft) long telescoping cantilever bridge that extended from the main stage to a ‘B’ stage in the centre of the stadiums. The only issue according to Keith was the fact that out door shows had the unpredictability of the weather to contend with. 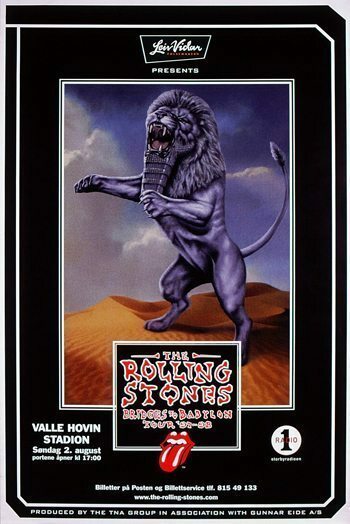 All in all this was another massive step forward in terms of the number of people who came watched The Stones perform: 4.8 million at 108 shows in 25 countries. It concluded on 19th September 1998 in Istanbul, Turkey. Five shows were cancelled (in Marseilles, Paris, Lyon, Bilbao and Gijón), and five more were postponed (in Italy, Ireland and Great Britain). As the ’90s wore on, Jagger became concerned with keeping the Rolling Stones fresh. That led directly to some of the dated experimentation on Bridges to Babylon, released on September. 23rd, 1997. 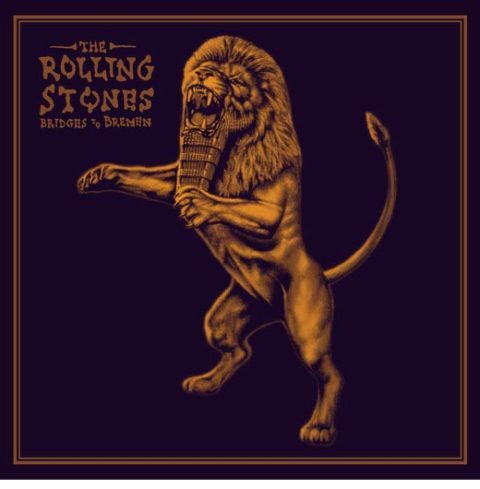 Over-worried about sounding too much like themselves after succumbing to a kind of easy classicism on 1994’s Voodoo Lounge, the Rolling Stones ended up going too far the other way. That meant bringing in then-hip producers John King and Mike Simpson. Known professionally as the Dust Brothers, they’d most recently been working with Beck. “Anybody Seen My Baby,” the lead-off single, was doomed to parody by their decision to include a sample of Biz Markie‘s 1986 track “One Two.” Deep cuts like “Might as Well Get Juiced” suffered too, as its generically electronic backing track felt somehow both relentless and largely without detail. Hiding somewhere within this tune is something that could have harkened back to the edgy smack-laced danger of 1972’s Exile on Main St. The loop-driven “Saint of Me,” written in tribute to their late long-time sideman Billy Preston, suffers a similar fate. It’s a pretty good Stones song lost in a maze of studio tricks. Jagger even brought in the sleek R&B producer Babyface to work on “Already Over Me” at one point, before discarding the tapes. “It’s full of fance – that’s funk and dance put together,” guitarist Ron Wood enthused in a 1997 . Fans were less enthusiastic, as the album became the Rolling Stones’ first ever – including 1986’s lightly regarded Dirty Work – to finish outside the U.K. Top 5. Bridges to Babylon ended up selling a million copies, but that was far less than the multi-platinum sales of their two most recent studio projects. Richards collaborated exclusively with stalwart Stones producer Don Was on the reggae-inflected “You Don’t Have to Mean It,” the soul-drenched “Thief in the Night” and his devastatingly sad album-closing “How Can I Stop.” All of them would have sounded more at home on one of Richard’s then-recent solo projects, For his part, Richards argued that while Bridges to Babylon may not have always worked, it had at least been interesting.